How can I obtain Nook Books on my Kindle Paperwhite? 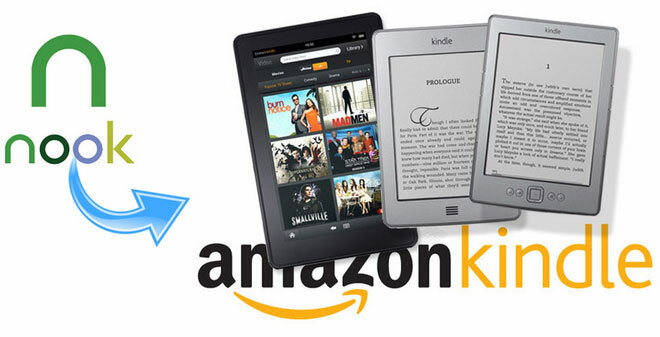 You may have a big collection of Nook books, and want to transfer them to Kindle eReaders for enjoying. However, it is a pity that these books you got from Barnes & Noble are in .epub format that can't be recognized by Kindle eReaders. So in order to read these Nook EPUB files on Kinlde eReaders, it's necessary to find a solution to convert Nook books to Kindle-supported format like MOBI. Here in the following article, we are going to show you the complete tutorial on how to convert Nook books to MOBI format and transfer to Kindle devices for enjoying. Before we convert Nook EPUBs to MOBI, one important fact you can't ignore is that almost all the EPUB files from Barnes & Noble are locked by Adobe DRM or Nook DRM and can't be directly converted to other eBook formats unless the DRM is completely removed at first. Therefore, if you need to transfer the DRM-ed Nook book to Kindle eReaders, there are two things that really matter: removing DRM restriction from Nook books with Nook DRM removal tool, and then converting the DRM-free Nook EPUBs to MOBI by using a professional eBook converter. It seems a bit burdensome, as you may need to use two programs to complete this task. But no worry, things changed thanks to the coming out of Any eBook Converter. 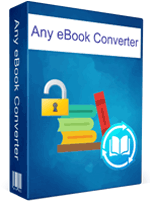 It is an all-in-one eBook converter, dedicated in helping users to bypass DRM restriction from protected eBook files (including Nook, Kindle, Adobe and Kobo eBooks) while converting them to other popular formats, such as EPUB, PDF, MOBI, AZW3, KFX or TXT. With this smart tool, you can easily remove DRM from Nook books and convert them to MOBI format without using any other programs. Any eBook Converter enables us to transfer Nook EPUB to Kindle devices with four simple steps, and below is a demonstration of the whole process. Before we get started, please have the program well installed on your computer. Click "+" button on the upper left and there will be a pop-up window allowing you to browse and upload the Nook books that you want to remove the DRM from. Click “V” icon on the bottom and select the output format - MOBI. By clicking the “Settings” button on the upper right, you can customize the output path for the converted books. Note: By clicking the "Edit" icon on the right, you can edit all the important and useful meta information by yourself, including title, author, publisher, etc. 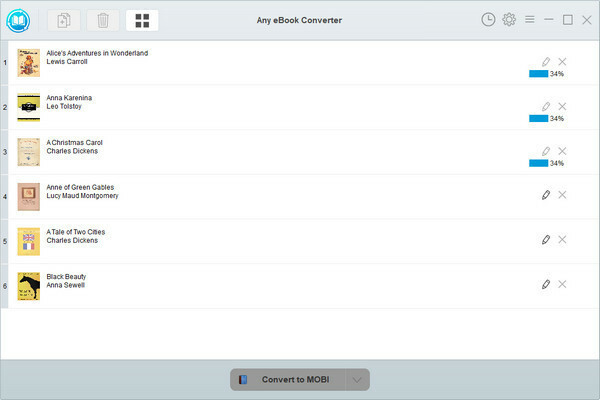 Click "Convert to MOBI" button to start converting your Nook books to MOBI format. 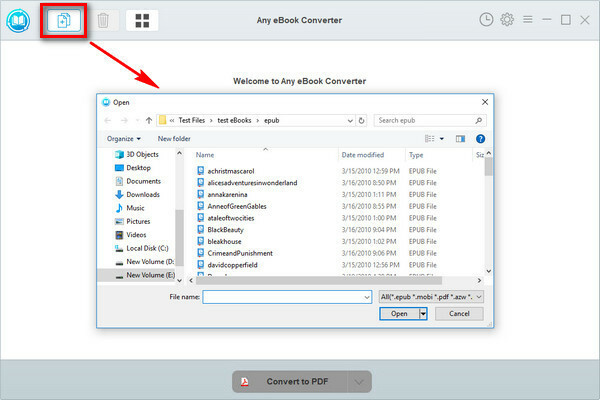 When the conversion is done, you can find the converted Nook files by clicking the “History” button on the upper right or directly going to the output folder you set in previous step. Now you've got your DRM-free Nook books. To enjoy the Nook MOBI books on your Kindles, all you need is to connect the Kindle device to computer using USB cable, and then copy and transfer the converted files to it. 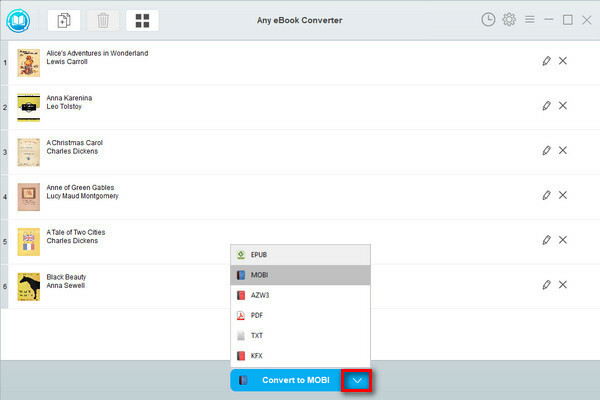 Note: The free trial version of Any eBook Converter enables us to convert one book at a time. If you'd like to unlock the amount limitation, please purchase the full version.